A. In 1980, Pope John Paul II issued a “pastoral provision” that said Protestant and Anglican clergymen who wished to become Catholic priests could do so and remain married. Since then, about 100 men in the United States have been ordained as Roman Catholic priests, according to this provision. Many Catholics do not know that the Roman Catholic Church had married priests up until the First Lateran Council in 1123, when celibacy became the rule for Latin-rite Catholic priests. The rationale for the discipline of celibacy is threefold: It most closely mirrors Christ, who was unmarried; it demonstrates that love can be real and strong without being physical, which is said to reflect the eternal life of heaven; and, as Paul indicated in 1 Corinthians (7:32), it allows a man to be free from the cares of raising a family, so that he can focus all of his energies on the work of the Lord. Your question as to how Catholic priests ordained as celibates feel about this pastoral provision is a good one, and I can only answer it anecdotally from random conversations I’ve had with priests. Some, I suppose, do harbor a bit of envy that those newly ordained as Catholic clergy under this provision can continue to enjoy family life with a wife and children, a choice that was not open to us when we were ordained. But for the most part, Catholic priests seem grateful that they will be helped in their ministry by this new pool of clergy. 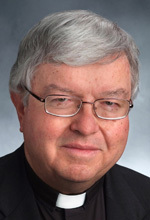 What bothers a fair number of longtime priests is that there are several thousand men in the U.S. who left the Catholic priesthood (mainly in the 1960s and 1970s) to marry and whose talents and background would render them equally suitable for ministry or more so. 1 Corinthians 7:7-9 “Yet I wish that all men were even as I myself am. However, each man has his own gift from God, one in this manner, and another in that. Perhaps, this stance should be re-evaluated. If St. Paul was unwilling to mandate it, then maybe it should never have been modified by mankind. It is not dogma but man-made law. At that time, I’ve been informed it had more to do with property than the Word of God. Taking one verse from an entire chapter is not reason enough especially when, after reading the entire chapter, it sends a different message. There are many good men, that I know who left the seminary, that would have made quality priests. It might be time to find those men given the circumstances.